Depart Anglesea at about 7.00 am (from O'Donohues Rd), passing through various towns to pick up others. 7.20 am in Fairhaven and 8.00 am in Lorne (at the round about outside the Cumberland Resort / Lorne Surf Life Saving Club). We usually then ride to Cape Patton and return to Lorne for coffees at the Lorne Beach Pavilion on the foreshore. 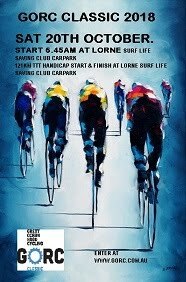 Alternate days or when raining, meet at 7.50am Lorne SLSC for swim to Pier & back 2.4ks. "The group rides on this website are not organised by this website www.gorc.com.au. Swimmers, runners & riders taking part in GORC activities do so at their own risk. Accidents can and do occur. We condone safe and legal swimming, riding & running practices and recommend you always wear a helmet, use lights when appropriate, and abide by local rules and regulations. We recommend you undertake medical assessments prior to any new activity / event or if you have any doubt about your current health, condition or fitness level. Any of the bunch/group rides or other activities or events found on the GORC website are undertaken at the participants’ own risk. Submission of an entry form or taking part in any GORC activity / event represents acknowledgment of your own responsibility and liability related to the activity / event." Usage of the GORC site grants you no right to any copyright or rights relating to the content of the site. All copyright is protected under National and International Law.